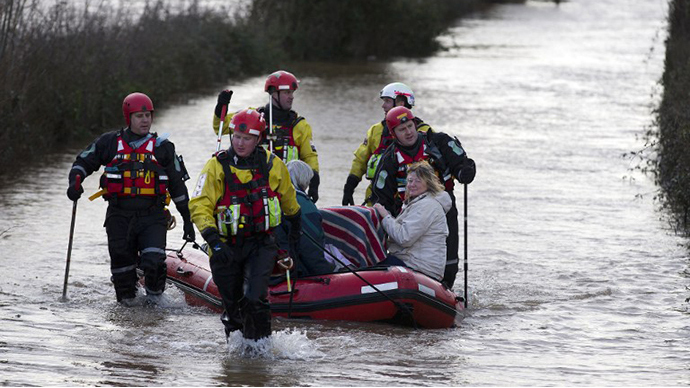 A 35-foot-wide sinkhole has opened up in the storm-battered UK as three people have died in a wave of floods spreading havoc across the southern England. 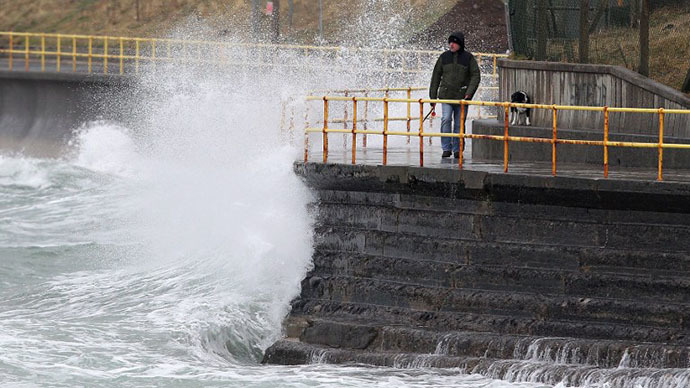 A total of 17 flood warnings, denoting a “danger to life,” are in place. One woman died after part of a building crushed a car driving past Holborn tube station in central London. The concrete front of the structure collapsed onto her car late Friday night. A further two people in their mid-20s – who were also in the car – were injured and hospitalized as a result of the incident, which is being investigated by police. “Sadly, despite extensive efforts to resuscitate her, a woman was pronounced dead at the scene,” a London Ambulance Service spokesperson said Saturday. Ten more people were evacuated from buildings in the area as a precautionary measure. A passenger on a cruise ship in the English Channel also died after a massive wave struck the British vessel Marco Polo as it headed toward Tilbury in Essex late Friday, smashing through a window, and injuring several passengers. The 85-year-old man was airlifted to hospital, but didn’t survive. Seventy-seven-year-old Bob Thomas of Caernarfon, North Wales, died after being hit by a falling tree in his garden last Wednesday. “My thoughts and condolences are with the family and friends of the people killed in the storms last night,” Labour Party chief Ed Miliband, the opposition leader, tweeted. 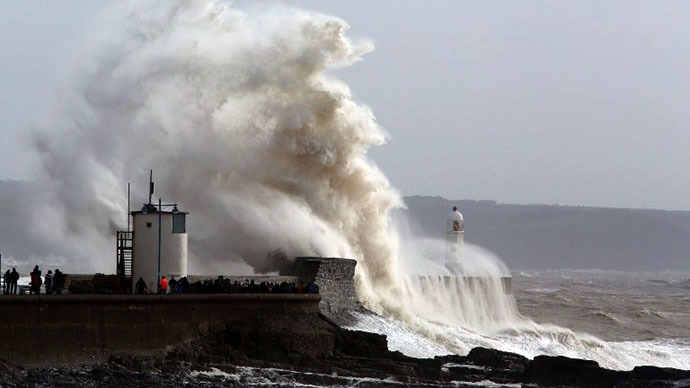 Strong waves posed a danger to the public in a seaside restaurant in Milford-on-Sea in Hampshire. Thirty-two people were evacuated when a tidal surge flooded the ground floor and windows were smashed by airborne shingle. 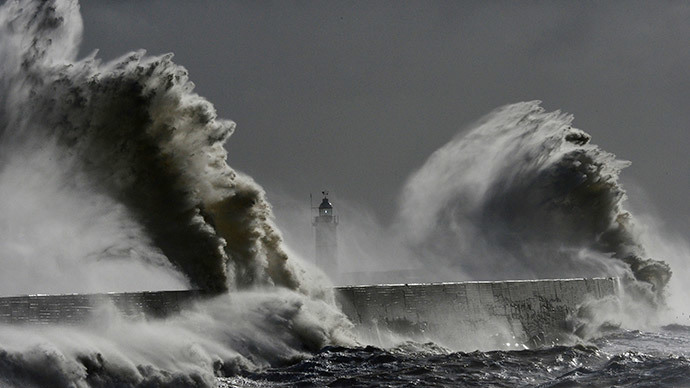 Over 140,000 homes nationwide are without power and severe weather warnings remain in place across the country, which has seen its wettest January in two and a half centuries. 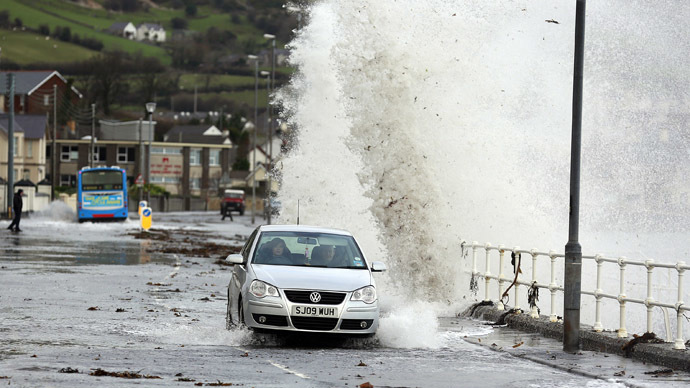 Gales of around 80 miles (129 km) per hour have swept through the country, according to the country’s Met Office. Seventeen families were forced to evacuate their homes after a sinkhole measuring some 35 feet wide appeared in Hertfordshire on Saturday – the largest of three such sinkholes in the space of a week. “Police are currently in attendance in Oatridge Gardens, Hemel Hempstead after receiving a report of a sinkhole appearing in the road at 7:30am,” Hertfordshire police said in a statement. They confirmed that the depth of the hole had reached 20 feet. “The road, and surrounding roads, have been closed for the safety of residents,” police said. The M2 – a motorway in the southeastern county of Kent – also developed a sinkhole 15 feet deep earlier in the week, while a garden, also in Kent, saw another crater – 10 feet deep – opening up. 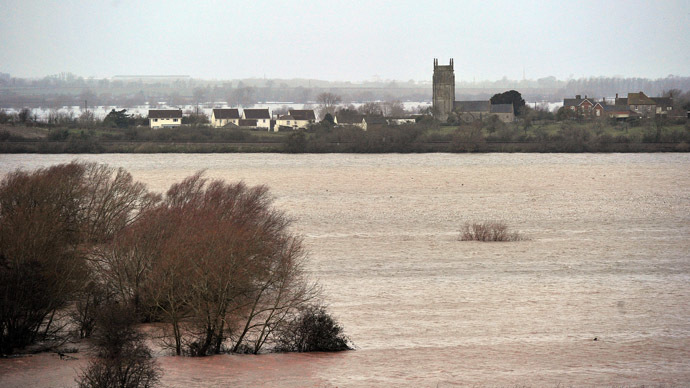 Low-lying areas in the southwest – specifically Somerset – have been submerged in floodwater since December. Train lines have been subject to delays and cancellations – some because of landslides – while a sea wall in the southwest collapsed as storms battered the coast last week, forcing the closure of the specific part of track that lay behind it. The UK has not yet applied for financial help from the EU to cope with the crisis. 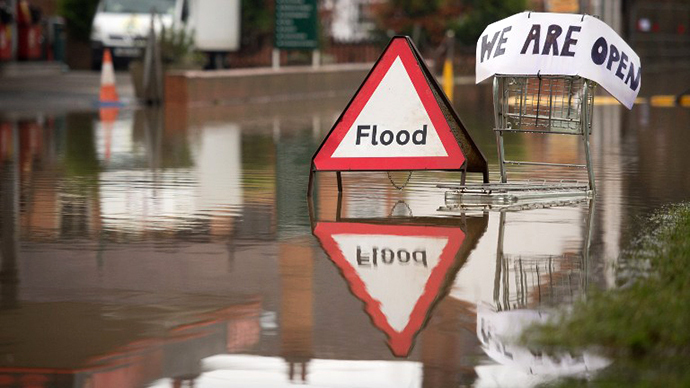 Prime Minister David Cameron declared Tuesday that money would not be an issue when it came to dealing with the floods. He has denied that there is a political motivation – in an increadingly anti-EU atmosphere in right-wing UK politics – behind the absence of a call for aid, despite the country having had its 10 weeks from the “first damage caused” by a natural disaster. “We are ready to consider the possibility of providing the UK with help – both in their struggle against the elements, and to contribute to the elimination of its effects – but for this we need to receive an official request from the British government, which we do not have,” the news service of the European Commission stated on Saturday, according to Itar-Tass. "As Labour and the Lib Dems have killed the Wharton Bill, the one way to guarantee a referendum is to vote Conservative at the Gen Election." On Friday, Welsh Plaid Cymru MEP Jill Evans reiterated her call to the UK government to apply to the EU Solidarity Fund which was set up with the intention of providing aid in such times of crisis, despite the deadline having technically passed. “The EU Solidarity Fund was set up as an emergency fund to be used by countries hit by natural disasters to help them recover. Welsh citizens, like all EU citizens, pay into the Solidarity Fund…the UK government should have applied immediately,” Evans wrote in a statement.